Congratulations to The University of Mississippi’s Department of Chemistry and Biochemistry who recently developed a chloroaluminate ionic liquid-based portable plating process for aluminum. Their invention was selected by R&D Magazine as a Top 100 Invention for 2014. All work done with the air-sensitive ionic liquid was done in their LC Technology glovebox. 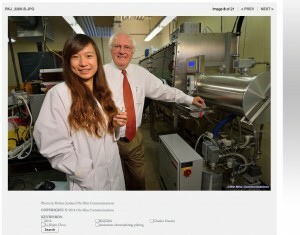 Pictured is Chair and Professor, Charles L. Hussey, Ph.D., alongside Postdoctoral Research Associate, Dr. Li-Hsien Chou.